Clint/John please set me straight if this is not the correct version. 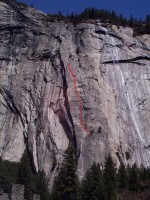 PAY ATTENTION to the traversing nature of the first two rappels and DO NOT get suckered towards the Ahwahnee Buttress route anchors. You may want to stop short and spot both the right and the wrong anchor before committing to the rappel or pulling the rope if you've reached the anchor. Thanks to the efforts of Clint Cummins a new rappel route has been created to the East of the main route. Climbers are urged to use these anchors to save the trees on the route from further destruction by using them to rappel/stand on during the descent. SoY rap route. Only one 60M rope is needed to get to the base of Serenity. As of January 19, there is a bat living in the crack on P2 just above the first tree growing out of the crack. I thought the odd noise was some strange bug, but when I jammed in, I hit something moist & furry, and withdrew my fingers only to see some fangs in the darkness. It freaked out every time I tried to work out a jam near it, and I couldn't flush the little guy out, so I put a cam in the crack between me and it so it couldn't bite me as I tried to climb past. I'm curious how long that thing will hang out on the route! finally did sons this week without getting my ropes stuck! in the past, i've rapped down to the top tree of pitch 2 (the anchor station with the 2 pitons and bolt at the top of pitch 2, the off-fingers sustained crack) and have managed to get the rope stuck above us in the crack of p3 and also stuck in the tree below us (the lower tree in the middle of p2)... this time, we rapped from the bolts of p3 to that lower tree (in the middle of p2) and had no issues at all. that lower tree was mentioned as sketchy, but it looked pretty solid to us, thick trunk, green leaves, looked solid. not sure if it was a different sequence of raps stations or just better luck... anyone have trouble with stuck ropes while rappelling??? thoughts on better rapping this route? top of p3 --> past the tree at top of p2 and rapped to the tree at middle of p2... could have gone to bolts at top of p1 with 2x70m but too much rope to manage all day to make it worth it. I see from other posts that you can rap with a single 70m, but I wonder if you would have to rap off the top of p2 instead of going to that lower tree in the middle of p2, and I think it was rapping off that lower tree that helped keep our ropes from getting eaten in the crack of p3. p.s. pitch 2 makes you earn it, and is just a really interesting, thought provoking pitch that I really enjoyed… but don’t get me wrong, I was certainly tired by the top. Pitch 3 and 5 are amazing, but damn, pitch 4 is just the hands down most enjoyable pitch I have ever climbed!!! …great exposure, immaculate rock with an uninterrupted lazor-cut perfect hand sized crack, I never wanted it to end. b. Sons of Yesterday last pitch - the rap tree burned out and it looks quite dead and rotten. We rapped from it nevertheless but it was kinda nervous. You can rap from the top of Sons of Yesterday all the way to the ground with a single 70 meter rope. Some (or most?) 60 meter ropes might be a bit short. The tree in question for an intermediate rap is plenty stout for a rap and has slings and rings on it. You do more raps this way, but you are less likely to smack the parties below you with the free end if you use just the single rope. You will get better mileage from using yellow (#2.5) Friends than from #2 Camalots. The Camalot is just a bit too big for most spots. This bolt was replaced in 3/2005 by Melissa and J. Nice job! We tried to rappel the route with one 70 meter rope and were a bit short of the P1 anchor/rap station, we used the little tree in the middle of the second pitch, like chris. I'm two bucks and my partner is a buck 50 and it held us but I don't know how many other parties this will work for. P2 is definitely the crux of this route. The crack that you walk on p5 can definitely be protected just by leaning down and placing at your feet. (It's implied in the supertopo that you can' protect it unless you do it as a hand traverse). I agree with Karl's revised ratings for this climb. I had a hard time telling any difference at all between sections rated 5.7 and 5.9. You can definitely rap the route with just one 60m rope, as long as it is a true sixty and you weigh at least a buck twenty. The super topo makes it seem as tho there is no pro on the 2nd. pitch of Sons (10A) at the wide pod that you lieback to gain footholds out left. Once you get established out there, there is thin splitter with an ideal mini-pod for a 1" tcu at about head height to give you perfect security for the next moves back to the crack. Save a piece for this and you will not regret it. As this route ascends the Awahnee Buttress (named for the original locals of the valley) the original route name is actually "The Sons of Chief Tenaya Memorial Route" in honor of the same that were massacred by the U.S. military in Tenaya canyon during the invasion of the valley by euro-trash (I'm sure Vince-bo will love this...it was actually his idea to memorialize those tragically killed...he really is very sensitive, tho he's too shy to show it....SMILE VINCE :). Drew made me shorten it for being too long and grandiose, so "S of Y" it is, I guess...In remembrence of all the sons lost to futile causes. The topo seems to imply that you need two ropes to rappel this route. But I'm pretty sure it can be done with just one. Rapping from the top of pitch two (above the tree) you would need to set up an intermediary rappel station at another tree, I noticed there are slings already, I looked at my (double) ropes and as I was passing this the rope was just at the middle mark. Anyone disagree with this statement? I'm not sure I agree with the ratings on the Supertopo. They are probably true for those with small hands. For a fat handed guy like me, The "5.9" in the middle of pitch 2 is more like 5.10, the "5.7" thin hands at the beginning of pitch 3 is 5.8+, the "5.9" steep hands on Pitch 4 is more like 5.8- but the short bulge sequence in the beginning of the pitch is 5.9. On pitch 5, the "5.9" hands is 5.7, I think you could do it with no hands. The 10a higher on that pitch is probably one of the lightest 10 sections in the valley, while the first 10a pitch down lower will spank you good! One of my favorite routes. Just climbed Serenity/Sons yesterday, we had the entire route to ourselves! And it was warm and sunny the whole way up. On Serenity the first half of the first pitch was wet, which made it a bit sketchy. I was able to dry the holds off enough with some chalk to get through, and the rest of the route was perfectly dry. On every pitch, the ratings felt right on with one notable exception: pitch 2 of Sons (10a). It's steep and continuous with lots of bulges, which made it difficult to get good footholds. And, the jams felt insecure the whole way. I thought it felt closer to 10c. However I haven't climbed much in Yosemite, and may not be sufficiently familiar with the skills required on this size of crack. I'm curious whether many people found this pitch to be similar in difficulty to the other 10a pitches on Serenity/Sons. Or would it be reasonable for me to question the rating...? Thanks guys for all the beta sounds like we will give it a go when we get over there. Maybe I read your post wrong...The 10d pitch is that last pitch of Serenity crack. If you have small fingers like me and can do a couple of pull-ups, it will feel like the softest 10d ever and probably will be easier that the 10b move on the second pitch. If you have fatties, you might be saying 11a, or so I'm told. The link-up pitch between the two climbs is ~5.5. If you called it 11a instead of 10d, I wouldn't argue since it is a bit stiff. But you get very good pro and the fall would be clean. Put a couple of pieces in from a good stance and then bust a move. It's a short crux so you are through it in no time. Good moves too. Yeah, it's about 10 feet of 10d. It's easy to place good gear before the crux. It's easy to place good gear in the middle of the crux too, it's just hard not to hang on it after you've placed it! Go for it - maybe you'll have to yard on a couple of pieces or maybe you'll fire it. I've seen people approaching Serenity from the left. Don't know how hard it is but it looks like a bit of a hassle. I've tried to do an "end around" the line on Serenity by climbing all of Maxine's wall, or, just a bad, some 11c chossy, scarey finger crack over a roof after the 10c on Maxines. Both were nightmares! For Maxines, you have like three dirt hummock mantles in a row! Can you do Sons of Yesterday without doing Serenity Crack? Is there some easy variation to the left of Serenity? OK, Chris is right in that the pitch lengths are wrong. I couldnt' rappell from pitch 3 to pitch 1. I went off that dinky tree like he did. no big deal. the bolt protecting the 5.8 slab move at the top is a joke. don't fall. The second pitch (after the 5.6) is harder than anything on serenity crack. 10a? Damn! The cracks eat ropes. Bring a Tibloc or two to jug back up! The z pitch at the top is one of the finest I've ever done. The wind is horrendous. i was cold in a long-sleeved shirt last week while the valley sweltered! I saw people rapping the first two pitches of serenity with double ropes. the tope says they should be 50 feet short of the ground! I don't believe that Chris M's comment on only one pitch requiring a rap longer than 100 feet is correct. Our 200 foot rope did not make the rap from the anchor at the top of the third pitch to the anchor at the top of the second pitch. We were 6-8 feet short of the anchor requiring fancy sling work to get to it safely. The second and third pitches have a hearty appetite for ropes when you pull them. The second pitch is incredible. did the first two pitches of this yesterday (rappelled early because it got dark) and there was nobody else on the route! pitch two in the topo is noted as 90 feet long. the pitch is actually 120' long. i promise to correct this in the next edition of the topo. this is a big deal because it means that you need to two ropes to rappel this pitch. (actually, one 70m rope would probably work but i am not sure.) this is the only pitch on the route that you need two ropes to rappel so you either have to bring two ropes or do what i did, rappel off a sketchy little tree at the beginning of pitch two. not reccomended!!!! On 10/26/01 the belay atop pitch 4 had one hangerless bolt.